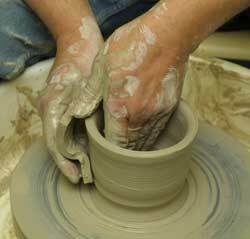 In this example the bowl is made from clay. The clay forms the body, but the actual bowl projects out as more than a clay shell; it must include the “empty space” in its definition. In fact a bowl is more about the “empty space” than the materials comprising the bowl. In part, our initial empty space is formed by parents, elders, teachers, culture, our bodies and tendencies of the mind. Yet each person has an incredible degree of freedom to shape their own empty space. At certain times this process is more dramatic than others, such as being a teenager or experiencing a mid-life crisis. These moments stand out as a time to question earlier frameworks that shaped our forms. These times can be difficult due to the twisting around of our core shape and beliefs: a time when our very nature is in flux. Often a person reshapes their empty space without the benefit of outside perspective, adding to the frustration and chances of something “breaking”. A person never truly breaks in this sense, but radically changing one’s own empty space then reflects out to form a vastly different person after the experience.